Opportunity stood down for nine days in early August as Curiosity landed and went through check-out, but on the tenth day the Mars Exploration Rover was back on the road, driving along the northwestern rim of Endeavour Crater and into the “sweet spot” of the clay mineral hunting ground at Cape York, crossing another major milestone and heading for a wild looking ridge that just may harbor the mission's next big finding. “We’ve been driving southward along a set of eastern facing outcrops on the inboard side of Cape York that we believe, based on orbital data, may contain clay minerals,” said Steve Squyres, of Cornell University, MER principal investigator, as he was about to take the chair for one of the Science Operations Working Group (SOWG) meetings last week. Spirit and Opportunity were designed and equipped to search for evidence of past water, and each of them did that. But phyllosilicates – and in particular the ancient clay minerals in the form of smectite that Opportunity is looking for – represent something more. They are evidence of past water that was more alkaline, an environment with less acidity than all other past aqueous environments this rover has uncovered in its eight years and seven months on Mars. Clay minerals speak of an environment more hospitable to life as we know it, and more conducive to the formation of life. Opportunity just took the images that went into this panorama of the finned and richly layered outcrop that she is now to study. The rover took these images with her stereo panoramic camera (Pancam) and Stuart Atkinson processed them promptly to give us this stunning view. With Opportunity on the hunt for the smectite, the elder rover is moving beyond MER's official 'Follow the Water' directive and cruising to the next level of NASA's Mars Program architecture, 'Determine Habitability' – which, actually, is what Curiosity is assigned to do. 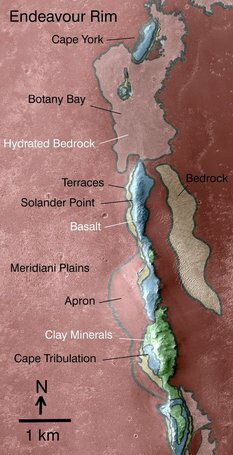 This map reveals the locations where the Compact Reconnaissance Imaging Spectrometer for Mars (CRISM) onboard MRO detected clay minerals at Edeavour Crater. This crater is about 22 kilometers (14 miles) in diameter. As indicated by the scale bar of one kilometer (0.6 mile), this map covers only a small portion of the crater's western rim. A discontinuous ridge runs north-south, exposing basalt (coded blue) and clay minerals (coded green) believed to be from a time in Martian history before the deposition of sulfates on the portions of the Meridiani Plains region that Opportunity has seen during its first 7.5 Earth years on Mars. 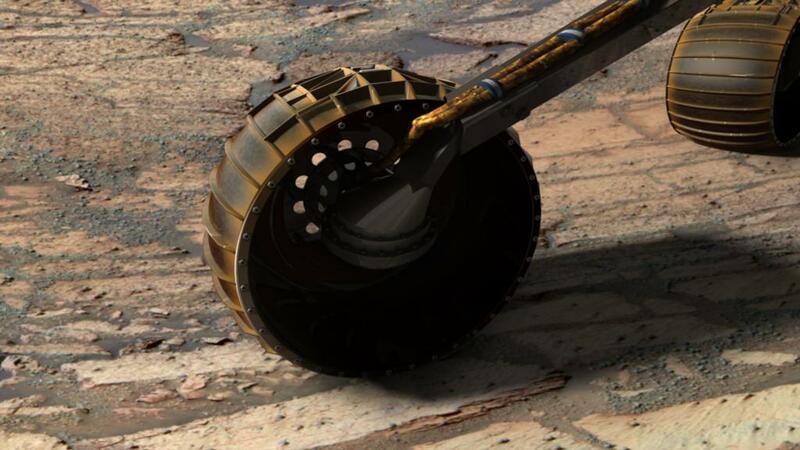 Opportunity and soon Curiosity will be on the hunt for clay minerals. That wild looking ridge, however, was interrupting that plan. "We might have to slam on the brakes and take a hard right," Squyres said, “The most spectacular layering we’ve seen yet is right in the heart of the strong orbital clay signature,” he summed up. But we have to talk about this." Squyres and other scientists on the team are drawn in by the layering and the wind eroded fins in the outcrop, which were crisper and even more alluring in the navigation camera images, and especially the stereo panoramic camera pictures in last night's downlink. 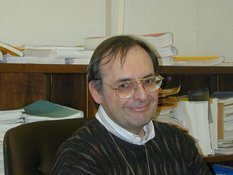 "We’re right where CRISM says is the sweet spot for the clay minerals in this area," confirmed Ray Arvidson, of Washington University St. Louis, the deputy principal investigator for MER and a co-investigator on CRISM, who has been studying the phyllosilicate prospects at Endeavour for months. "The fins are the geological features that stick out and they are drawing us to go there," he added later. Despite a couple of other suggested possibilities for Opportunity to undertake, nothing could compete with the combination of visual and spectral properties of the wild looking ridge or the insistence of Squyres and Arvidson that west is the way to go. Opportunity took this picture of the wild looking outcrop that caused the MER science team to direct the rover to make a hard right turn to the west while driving along the inboard side of Cape York in August 2012. This a raw image that the rover took with her navigation camera on her Sol 3057 (Aug. 30, 2012) as she was on approach to the finned bedrock. Up on Mars, Opportunity received her commands for the day . . . and before the long Labor Day weekend the rover took that hard turn and began driving due west to the target-rich outcrop straight ahead. “The whole science team is excited – it’s like watching popcorn pop," said Bill Nelson, chief of the MER engineering team at the Jet Propulsion Laboratory (JPL), where the MERs and Curiosity were designed and built. “Actually, everybody’s excited about getting to new areas and finding new stuff, even those of us who are not making the discoveries ourselves but merely supporting that effort." Most rover people were confident that Spirit and Opportunity's early triumphs would lead to more powerful descendants – "success breeds boldness in the planning," as John Grotzinger, of Caltech, Curiosity project scientist and MER science team member, told the MER Update during Mars Science Laboratory (MSL) landing. But no one, even in the craziest of dreams, expected Opportunity to still be roving when Curiosity landed, especially after the bigger, badder, laser-toting rover was delayed by two years. And yet, not to be outdone, more than eight and a half Earth years after scoring "the first interplanetary 300-million-mile interplanetary hole-in-one," bouncing onto Meridiani Planum, Mars and rolling into Eagle Crater on January 24, 2004, PST, Opportunity is still – not just roving but actively in the game, moving in on Curiosity's scientific territory and chasing down what could be one of the MER mission's most significant scientific achievements. "We’re on the search now for the host rock for these clay mineral signatures we’re detecting from CRISM data," said Arvidson. The High-Resolution Imaging Science Experiment camera onboard the Mars Reconnaissance Orbiter, known simply as HiRISE, captured this image of Curiosity while the orbiter was listening to transmissions from the rover. Curiosity and its parachute are in the center of the white box; the inset image is a cutout of the rover stretched to avoid saturation. The rover is descending toward the etched plains just north of the sand dunes that fringe Mt. Sharp. 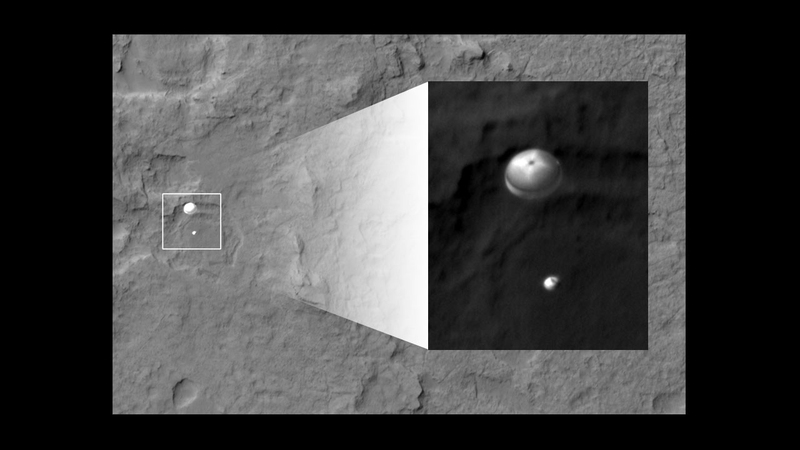 From the perspective of MRO, the parachute and Curiosity are flying at an angle relative to the surface, so the landing site does not appear directly below the rover. "Touchdown confirmed," announced EDL engineer Allen Chen, when the Curiosity's landing signal reached Earth at 10:32 p.m. PDT. "We're safe on Mars." That's when the party started. This artist's depiction shows something like what the real event looked like. 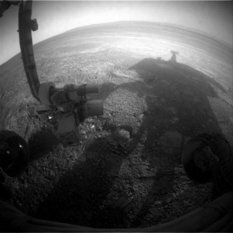 While Curiosity landed and got settled on Mars, Opportunity quietly worked on autopilot for the first week and a half of August, conducting a kind of science light campaign during the requested stand-down, "chomping at the bit to get roving," said Nelson. The stand-down was called to free up time with the Deep Space Network (DSN) for Curiosity's grand entrance, but once the new rover completed its check-out and began finding her "Martian legs," Opportunity roved on. “We’re excited with Curiosity’s arrival,” said John Callas, MER project manager, of JPL. “Like the older sibling, at first we were a little bit jealous of all the attention the new baby was getting when it came home from the hospital, but now we realize we’re the older, dutiful sibling and so we’re responsible for instructing the younger sibling on how to explore the surface of Mars," he explained using an easily understood analogy. "MER is now exploring with a restricted suite of instruments in an area we think has clay minerals and what we learn will feed back into how to do the campaigns with Curiosity," Arvidson explained from the scientific perspective. The two missions are "complementary," he underscored. "Not competitive." Sure enough, the MER and MSL teams are comprised of many of the same people, and amidst the jubilance of Curiosity's incredible landing, there was plenty of homage paid to Spirit and Opportunity, the first fully mobile, self-contained rovers to go over Martian hill and dale on expeditions that have lasted years. "Spirit and Opportunity were a great advance . . . the geologists who for the first time went into the fields of Mars with their cameras and hammer," reflected JPL Director Charles I. Elachi. "What we did on MER allowed us to learn a lot more about how to navigate and work on the surface of Mars." 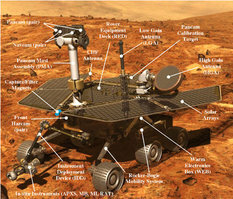 Mechanically, MER had "a huge influence" on Curiosity, said Rob Manning, the MSL / Curiosity chief engineer, who also served as the MER entry, descent and landing system manager, and the flight system chief engineer for Pathfinder/Sojourner, responsible in no small ways for getting all four rovers safely to the surface. "The influence is the capability. Curiosity is really MER in terms of the capability of the driving . . . the software, the algorithms, the people who wrote the software are the same, the rover drivers are the same, the capabilities, the processing of the terrain, how to drive – all that stuff is all MER," he pointed out. 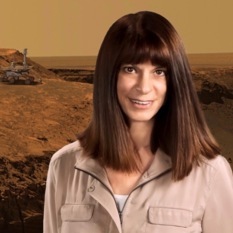 "It was Spirit and Opportunity that got us into the dimension of Mars where we're exploring layered terrains that preserve a record of history," noted Grotzinger. "With Spirit at Home Plate and Opportunity at Endurance Crater, we worked out a stratigraphy of events that told us what happened [in the past] on Mars, measuring a meter or two. Imagine what we're going to be able to do with Curiosity and hundreds of meters." 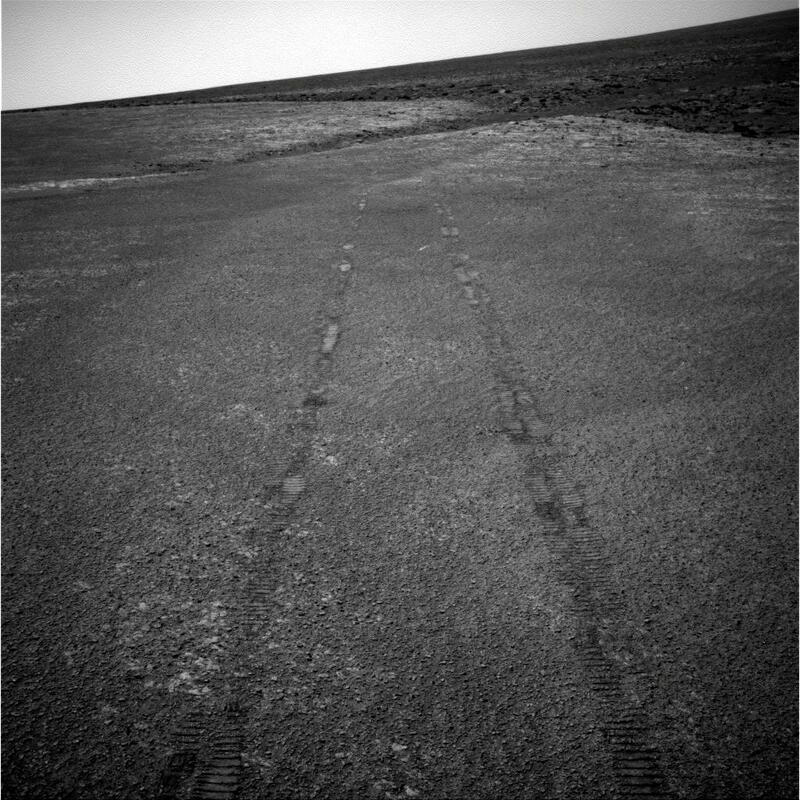 This synthetic image of Opportunity inside Endurance Crater was produced using "Virtual Presence in Space" technology. Developed at JPL. This technology combines visualization and image-processing tools with Hollywood-style special effects. The image was created using a photorealistic model of the rover and a false-color mosaic that rover took on its Sol 134 (June 9, 2004) with the panoramic camera, with the 750-, 530- and 430-nanometer filters. The size of the rover in the image is approximately correct and was based on the size of other features in the image. While Curiosity continued to make headlines throughout August, Opportunity, true to her MER spirit, seemed almost to be trying to take it back. "We crossed 35 kilometers of odometry last week," Callas announced during the last week of the month. That put the rover within "striking" distance (or around 350 meters) of the Apollo 17 Moonbuggy record of 35.89 kilometers, which of course was a kind of an all-terrain vehicle piloted by a human on the Moon. Once past that, the Mars Exploration Rover will have but one distance record left to best: Lunokohd 2. The Russian rover that landed on January 15, 1973, operated for about four months, and covered 37 kilometers (23 miles) of terrain. Tomorrow never knows and Mars is a dangerous planet, but the energy on MER is as good as it gets. The entire team is amped about the scientific riches in reach and the state of their charge. Most everyone is confident that Opportunity can go at least another two kilometers and beyond to assume the title of – the robot extraterrestrial vehicle that drove the longest distance on the surface of any planet beyond the Earth. So far, so good. “Opportunity continues to be in very good health,” reported, Callas, who has had his sites set on that Lunokhod 2 distance record for years. Power levels are averaging around 550 watt-hours or a little more than half the power that the rover had on landing, plenty robust enough for driving and doing the science investigations needed to find the clay minerals. The skies overhead remain hazy, but that's actually good for a Martian spring when the winds blow and the rusty red dust can easily whirl up to darken the atmosphere and cause the skies to become opaque. This is an image taken by the HiRISE camera on MRO, showing an aerial view of Endeavour Crater and the part of the rim that Opportunity is currently exploring, which the MER team calls Cape York. It won't just happen though. The clay mineral story is going to take a while to pull together. "The point is not to confirm there are phyllosilicates there," reminded Squyres. "We know there are phyllosilicates are there. The point is to see what there is to see why they're there, how they got there." With two critical instruments out of commission, even the confirmation of the simple presence of the clay minerals won't come easy. "It's going to take a lot of detective work," said Arvidson. "It’s really trying to understand Mars and its past history. This is a campaign that will take weeks and weeks," he predicted. One year ago, back when Opportunity first arrived at Endeavour after that three-year, slow marathon across Meridiani terrain, the MER mission was said to have begun anew but somehow, gauging from the scientists' reactions and the sheer enthusiasm and excitement among the team members this past month, it almost seems as if the mission has begun anew – again. "It’s totally cool. The inboard side of Cape York is like another new mission," Arvidson chuckled. "I’m as excited as I get." 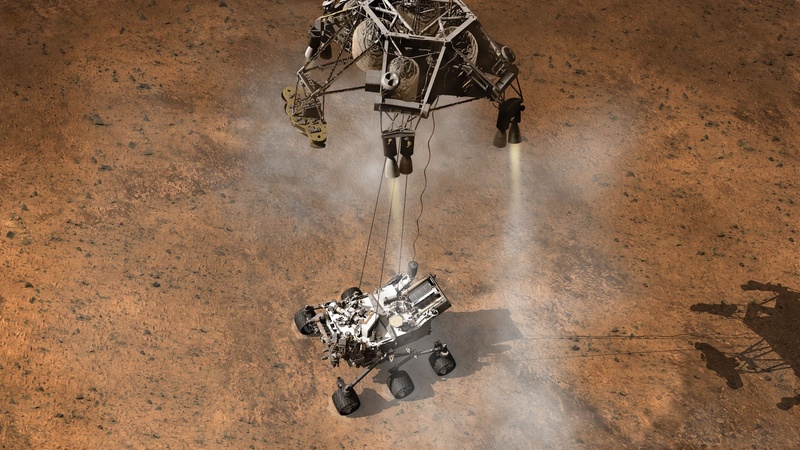 In the aftermath of Curiosity's spectacular landing, Opportunity kept her robot nose to the grindstone, took care of business and then did what she does best, roved on. But at the end of the sol, as roverfolk would say, August 2012 turned out to be one of the best months ever, "probably among the top four or five for Opportunity," said Arvidson, along with roving into Victoria and measuring the sedimentary section, and more recently getting to Tisdale and Salisbury and doing initial measurements of the Noachian crust of Endeavour Crater. The "very top" month? January 2004 and landing in Eagle Crater, Arvidson proffered. "Crater hopping, right? And getting into the third dimension." Opportunity took the images that went into this panorama of the small impact crater dubbed Sao Rafael in August and it was promptly processed into this picture by Eduardo Tesheiner, of UMSF.com. Now, as summer ends in the southern hemisphere on Earth but begins on Mars, Opportunity is at the wild looking ridge, positioned before the as yet unnamed "beautifully layered" outcrop with the alluring fins. Both robot field geologist and her team are staring at the kind of terrain that promises, like a booklet of "E" tickets, to take them to another time, another Mars the rover has never before seen. Mars rover engineers and scientists lost a colleague, mentor, and friend when Jacob "Jake" Matijevic passed away August 20 in his home in Los Angeles. The world lost one of the original Mars rover pioneers. He was 64. The news hit hard, especially within the ranks of the Mars Exploration Rovers (MER) and Mars Science Laboratory (MSL) teams. A systems engineer at JPL, Jake devoted much of his life's work at the Lab helping to create robots for NASA that could rove around on Mars, and knowing every last little detail about how they worked. He was a trusted and respected peer among his colleagues, a mentor to younger engineers, and "a really nice guy who was more interested in others than himself," as one of his fellow engineers put it, something of a rarity in today's self-aggrandizing world. Jacob "Jake" Matijevic, one of the original Mars rover pioneers. Integral in the MER project, Jake probably had a lot more to do with the rovers becoming the Spirit and Opportunity we know and love than most people realize. He was assigned to MER following his work as the manager for the Microrover Flight Experiment – or in other words as the project manager for the first U.S. Mars rover, Sojourner – the microwave-sized robot delivered to the Red Planet's surface by Pathfinder in 1997. He was on the first team that wrote up the initial MER proposal. He was there as the proposal was accepted by NASA, through the Administrator's decision to make one rover two, and in deep during the lightning fast years of development. He was there for the "births" of Spirit and Opportunity, the launches, the landings, and six years of surface operations and exploration when he served as the chief of MER engineering . 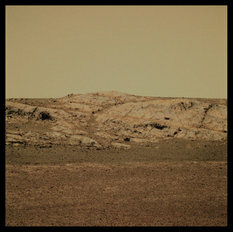 . . and beyond, even as he worked on Curiosity, because he kept coming back to check on the twin robot field geologists. "He cared deeply about the rovers, and understood them in an integrated way with an insightful system engineer’s perspective," said Joy Crisp, of JPL, the project scientist for MER who worked with Jake since the very beginning of the project, and more recently on Curiosity. "He was cognizant of the 'bigger picture,' as well as the details." "He was not only an excellent systems engineer, no detailed view or nuance of a system and its interrelationships escaped his attention, but he was also a mathematician extraordinaire," noted J. (Bob) Balaram, who is on the technical staff of Mobility & Robotic Systems Section at JPL. Off the top of his head, Jake knew more about the systems and inner workings of Spirit and Opportunity than perhaps anybody, and whether you were a colleague, team member, or journalist, if you had a question about the engineering, how something worked, or the health status of Spirit or Opportunity, Jake was the man with the answers. "Jake was the 'go to guy' for detailed information about the MERs and their operation," remembered Arvidson, "a complete gentleman, always kind and patient with science team members." Throughout the years, Jake also served as a member of or consultant to the "A" or anomalies teams that formed when something untoward or confounding happened, and later on review committees who advised on plans for risky, tricky, or rover saving maneuvers. "He knew everything about Spirit and Opportunity," said Bill Nelson, who took over the post of MER engineering team chief in October 2008 when Jake was re-assigned to what would be his final role on the MSL / Curiosity mission. Born November 3, 1947, Jake was the first of four children blessed to the late Jacob and Helen (Nastav) Matijevic, in Chicago, Illinois, according to an obituary that ran in the Chicago Tribune August 31st. He grew up in the Chicago area, received a BS in mathematics from the Illinois Institute of Technology in 1969, then went on to the University of Chicago, where he earned an MS in 1970, and PhD in mathematics in 1973. After accepting and completing a postdoctoral fellowship at the University of Kentucky, Jake landed an assistant professorship in mathematics at the University of Southern California. A few short years later, in 1981, he traded academia for JPL. 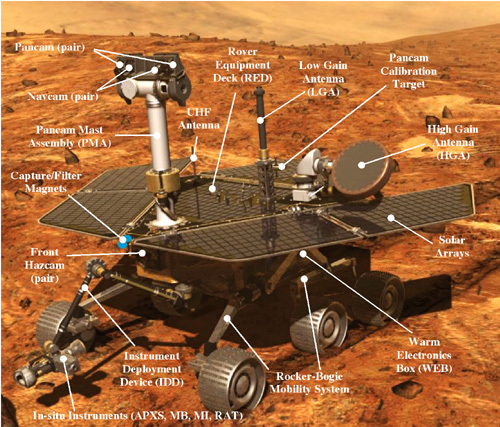 This simulated pictures shows the Mars Exploration Rover model, its equipment, and various systems that Jake Matijevic knew so well, and which enabled Spirit and Opportunity to work as robot geologists while they are on the surface of Mars. Here in Southern California, Jake distinguished himself with the Matijevic Theorem, described as "one of the most beautiful results in recent years in communicative algebra and some of its consequences," first published in Lectures on the Asymptotic Theory of Ideals, London Mathematical Society Lecture Note Series 113, by the Press Syndicate of University of Cambridge in 1988. The ensuing decade would take him to Mars. By 2000, Jake was working on the genesis of Spirit and Opportunity and his life all but revolved around the twin robot field geologists. He would laugh sometimes, like a kid, when he talked about the rovers. He loved what he did that much. "I do this everyday," he said during one interview. "I look for information, worry about what the future holds for them, and think about what they did in the past. A substantial portion of my work life has been devoted to Spirit and Opportunity. The thing is I don't anthropomorphize in this regard. But at the same time, this is one way to spend one's life and I have been very privileged to do this. "When I meet people and tell them what I do, I can see the thoughtfulness and the impression they have in their eyes – you know – 'you're a lucky guy.' I don't think I've ever met anyone who didn't have that feeling about this kind of work, so if I get that every couple of weeks – well, I don't have any questions about whether I did the right thing with my life." Jake's ability to teach was evident in every conversation and through the years he was always there for the MER Update. In person and on the phone, he was quiet, somewhat effacing, and noticeably private. It took a while for him to feel comfortable talking casually with a journalist, but when the late afternoon musings emerged, they were always rich with insight and often revealed how in tune he was with the zeitgeist. As time passed, Jake, who didn’t like to anthropomorphize, finally did, and we shared many conversations about Spirit's and Opportunity's distinctive personalities. More importantly he seemed to grok early on that these two rovers represent far more than robot field geologists made of composite materials, glass and mirrors, wires, circuit boards, rocker bogies and aluminum wheels, and he contemplated the greater meaning of the rovers over the years . . . how they transcended boundaries . . . and how they roved not only into human consciousness, but into our human souls. "Spirit and Opportunity are a combination of science fiction becoming science fact, I think, and the notion that maybe this – they – are another way to look at how humans project themselves into an alien environment," he said one night. "These rovers are giving people insight into a place that they will never have a chance to see for themselves on their own, or in any other fashion than this, in their lifetime. So the worldwide attention, the affection have come from having something else, something new, something incredibly different and amazing to give us input." There's a saying that no one goes into space alone and that's as true a statement as statements can get. But in no small measure, we have, the world has Jake Matijevic to thank for that something incredibly different and amazing that came to be Spirit and Opportunity. He is, as many colleagues have said, deeply missed. Jake passed away after a life-long battle with asthma and other upper respiratory illnesses, according to the Chicago Tribune obituary. He is survived by his mother and his sisters, Maryhelen of Chicago, Patricia of Loveland, Colorado; and brother, Paul (and Judith Wolf) of Park Ridge, Illinois. Memorial gifts may be made to the Mount Carmel High School Educational Foundation, 6410 S. Dante Ave., Chicago, IL 60637. As July came to a close, Opportunity played a stand-in role just before she stood down for Curiosity. On Sol 3028 (July 31, 2012), the rover transmitted a UHF signal configured to be what Curiosity's UHF signal would be at landing and the Parkes Radio Observatory in Australia successfully picked it up, putting that antenna on MSL landing duty. 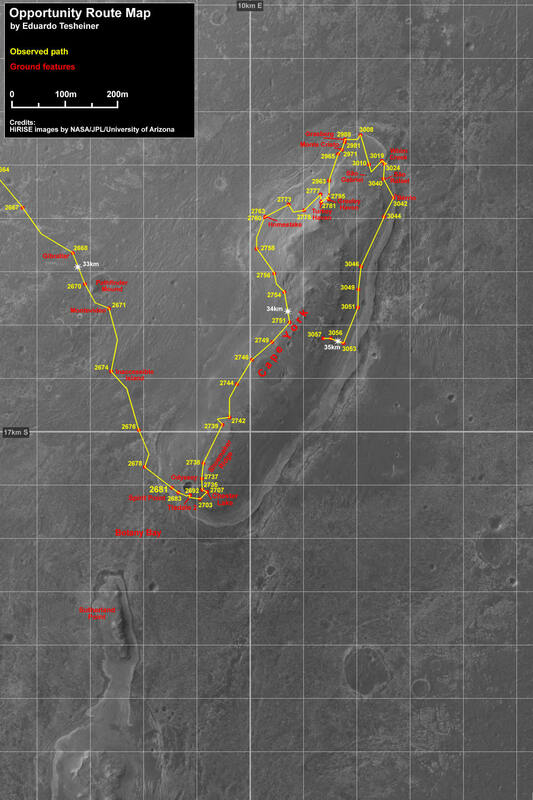 This route map shows Opportunity's travels up to its Sol 3057 (August 29, 2012), and the rover's approximate current location at a wild looking outcrop on the inboard side of Cape York. This image was produced by Eduardo Tesheiner, of UnmannedSpaceflight.com, who created it from images taken by cameras onboard the Mars Reconnaissance Orbiter. The rover worked quietly during the arrival of Curiosity, finishing up a study of Whim Creek, and then hit the road. 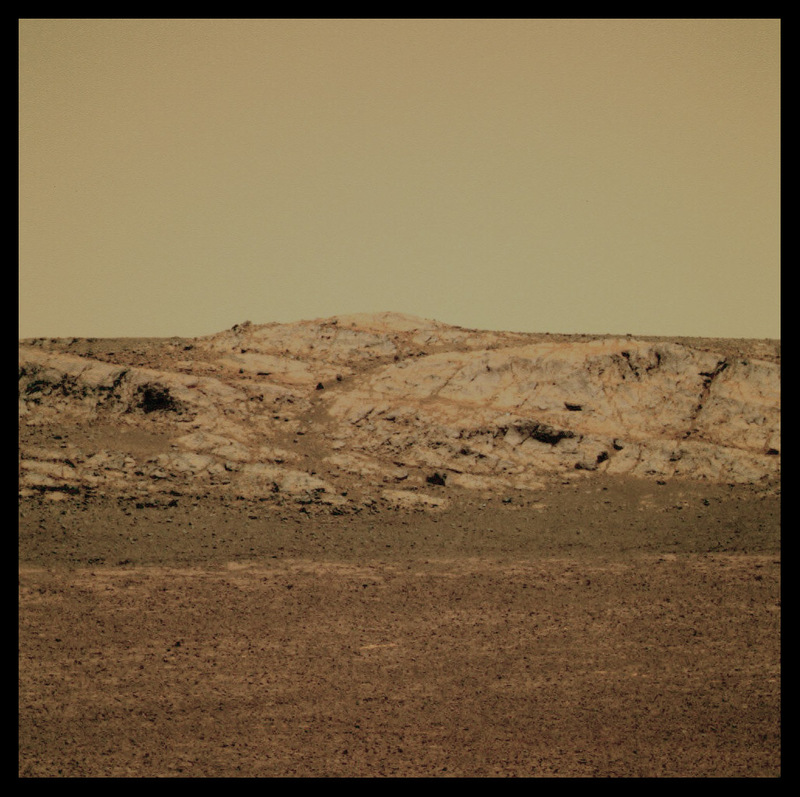 As August dawned on Meridiani Planum, the sky over Opportunity was still pretty hazy and the atmospheric opacity or Tau continued to hover around 0.642. 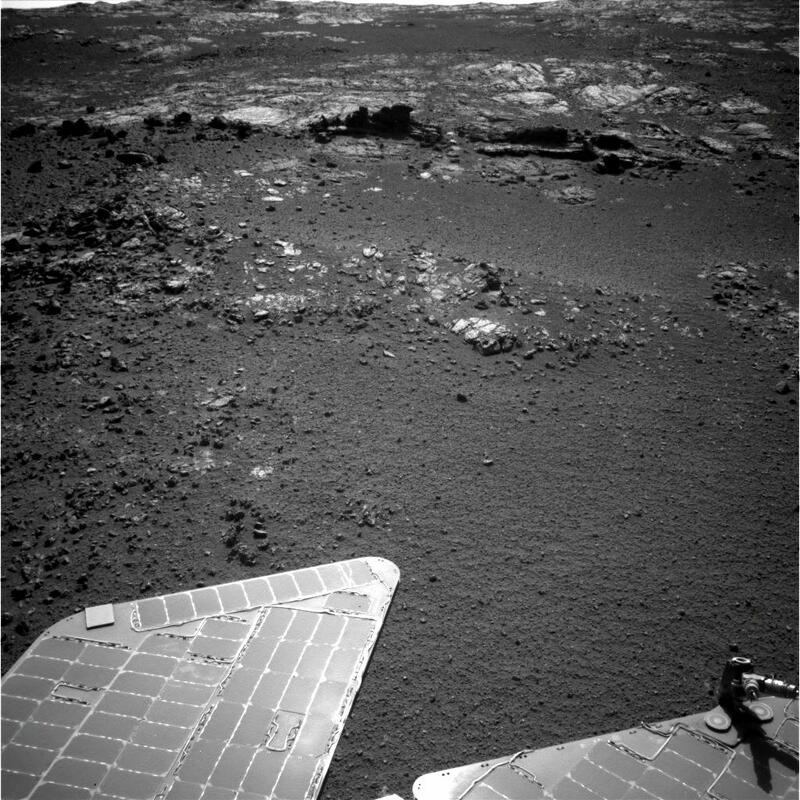 But it wasn't as hazy as it might have been after two storms passed near Endeavour Crater in July and Opportunity, reporting a solar array dust factor of 0.720, was accessing a good amount the sunlight hitting her solar arrays and producing ample power levels, around 547 watt-hours. With 34.63 kilometers (34,639.45 meters or 21.52 miles) behind her, the rover began the month quietly checking out a surface target of Whim Creek called Rushall-1 with her alpha particle X-ray spectrometer (APXS). 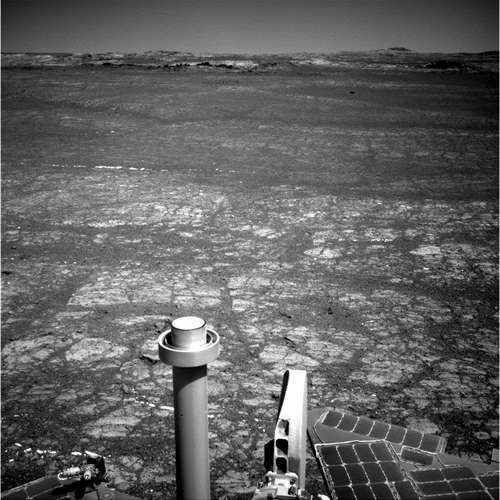 The following sol, August 2nd on Earth, Opportunity officially began the stand-down in preparation for the arrival of Curiosity and the first sol of the nine-sol plan she had onboard to keep her busy as the MSL rover closed in on Mars, landed, and went through check-out. The point of the stand-down was to free up Deep Space Network (DSN) tracking coverage during Curiosity’s entry, descent and landing. Opportunity's stand-down campaign called for more analysis of Rushall-1 during the first week of August. On Sols 3030, 3031, 3033 and 3034 (August 2, 3, 5, and 6, 2012), the rover conducted overnight APXS analyses on the surface target, and also took multi-filter Pancam images of Whim Creek on Sols 3031 and 3032 (August 3 and 4, 2012). Every sol, the rover took the Tau and conducted other routine engineering tasks. With Curiosity’s safe landing on August 5th, the MER team began planning for Opportunity to resume driving, although the rover continued with limited activity into the second week of August. 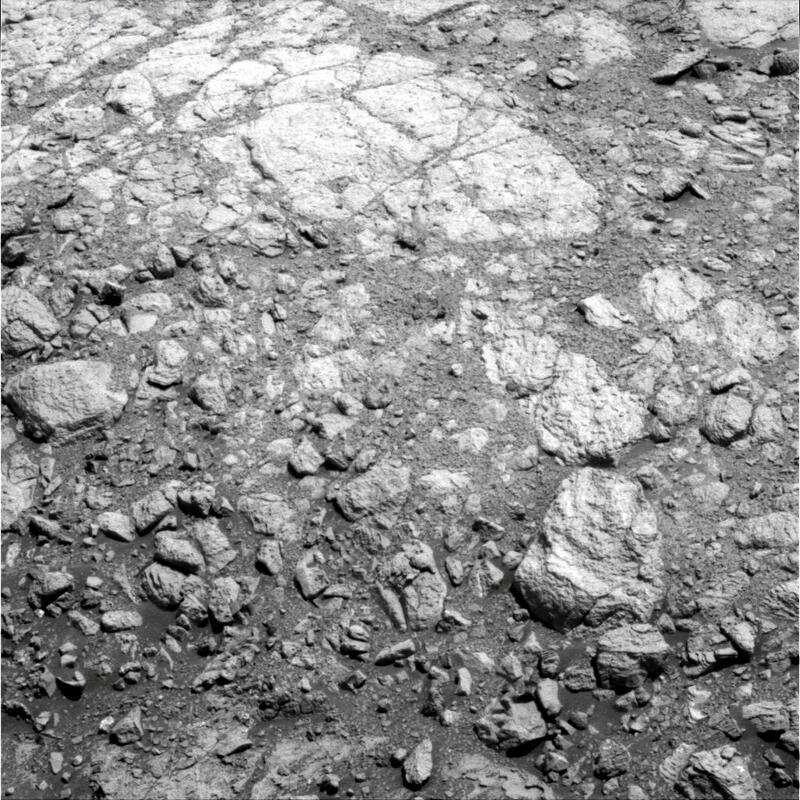 Opportunity finished the assigned APXS measurements on Rushall-1 on Sols 3036 and 3037 (August 8 and 9, 2012), as well as acquired a Pancam color mosaic of Whim Creek, Pancam pictures of a bright pebble near Rushall, and other remote sensing. The rover swung her IDD or robotic arm out of the way on Sol 3039 (August 11, 2012) and then took some detailed Pancam images of Rushall-1. It seemed as if the MER team had to almost pull the reins on Opportunity to stop while Curiosity landed. "That’s true, but remember that we also had this long stand-down during the winter, so much of what you’re seeing with Opportunity in recent weeks is kind of coincidental," said Nelson. "We’ve been chomping at the bit and talking about going after phyllosilicates since before we got to Cape York, and then the rover had to park for winter. After that, with the MSL landing – which probably adds a little bit of friendly rivalry – we couldn’t go anywhere. We were getting kind of stir crazy and from the first hints of the Martian spring, we have been anxious and ready to start driving again." Opportunity took a closer look at her immediate surroundings during a science light campaign the rover worked on during Curiosity entry, descent, landing and check-out on Mars. 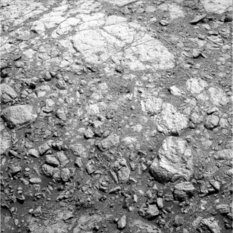 The rover snapped this raw image with her Pancam during that nine sol stand-down campaign. On Sol 3040 (August 12, 2012), Opportunity did just that, roving on to the south toward a small crater dubbed Sao Rafael along the inboard side of Cape York on the rim of Endeavour Crater, putting 27.5-meters (90 feet) in the rearview mirror. The robot field geologist conducted a drive-by shooting of the depression in the ground left by some ancient impact, then, on Sol 3042 (August 14, 2012) drove again, with a 39-meter (128-foot) jaunt toward Berrio, another small impact crater, bringing her odometer to 34.70 kilometers (34,705.88 meters or 21.57 miles). With 545 watt-hours of energy, she had plenty enough power to also take an atmospheric argon measurement with the APXS. So far, so good. But there was bound to be some adjusting to life and exploration on Mars now that Curiosity was taking some of Opportunity’s communications time and dataspace with Odyssey, the MER’s primary data relay link. 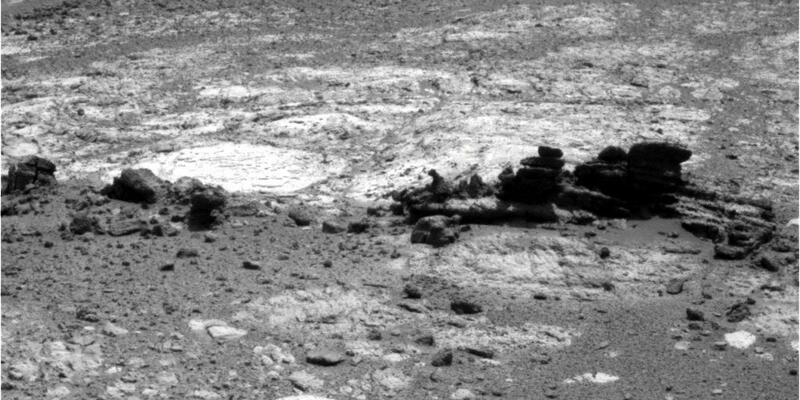 And on that same Sol 3042, the MER team overflowed the buffer. “We used to have about 258 megabits worth of buffer and when Curiosity wanted to have buffer space on Odyssey, we were reduced to about 123 megabits,” elaborated Nelson. “It’s a ring buffer. You can think of it as starting at the top of a ring or the top of a clock-face and filling up the buffer around 3 o’clock and 6 o’clock and so when it gets back to 12 o’clock, it starts overwriting data that was first put into the buffer," he explained. "Since we send our high priority data first, whenever a buffer overflows, it means that the lowest priority data sent, or, usually, the last stuff we sent overwrites the highest priority data or the stuff we sent first, so we lose our highest priority data," Nelson continued. The data is not lost forever, however, only on that downlink. "Our process automatically does not delete the data on the rover, so we can always retransmit it. We never delete on rover until we confirm everything we want is on the ground. The result was that it complicated planning a bit," he said. 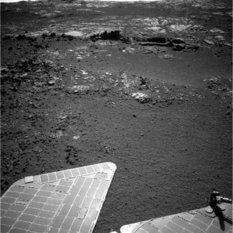 The MER team promptly adjusted and on Sol 3044 (August 16, 2012), Opportunity drove another 40 meters (131.23 feet), staying close to the inboard outcrop terrain along Cape York. As she drove, the rover began to visually document the exposed outcrop, taking pictures in black and white with her navigation camera (Navcam) and in color with her Pancam. Once Opportunity began driving again after Curiosity's spectacular picture perfect landing, the rover headed south along the inboard side of Cape York looking to the west and snapping pictures of the outcrops as she went, first with her navigation camera and then with her stereo panoramic camera (Pancam). Stuart Atkinson processed this image of one of those outcrops in Martian color. Two sols later, on Sol 3046 (August 18, 2012), Opportunity completed another southward trek, this time roving for 100 meters (328.08 feet), snapping pictures of the outcrops along the way. Pressing ever onward, the rover put another 40 meters (131.23 feet), behind her on Sol 3049 (August 21, 2012), assembling an extensive image set of the outcrop, and bringing her total mileage to 34.84 kilometers (34,846.61 meters or 21.65 miles). As the last week of August got underway on Sol 3050 (August 22, 2012), Opportunity continued roving to the south along the inboard edge of Cape York, surveying the exposed outcrop. The MER team directed their rover to document this area pretty thoroughly so that the science team could determine the best area to begin the hunt for the clay minerals since the orbital data from CRISM detected the signature for smectite, a form of clay minerals that are phyllosilicates. 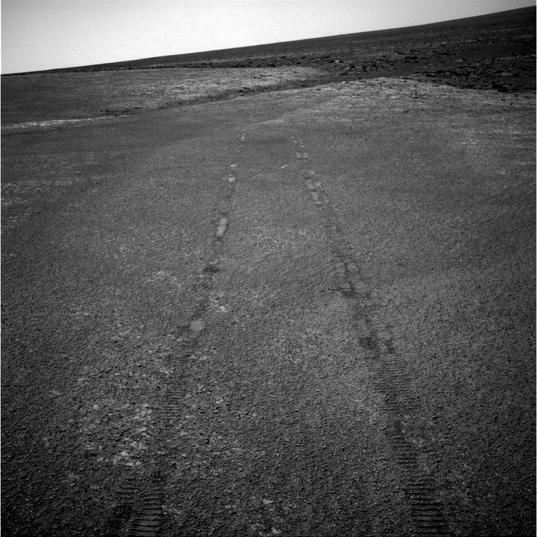 On Sol 3051 (August 23, 2012), Opportunity continued the trek southward with a 30-meter (98.42-foot) drive, and the campaign of taking pictures of the outcrops to her west with both her Navcam and Pancam along the way. Two sols later, the rover drove further south, though with more of an inboard bias to be closer to the outcrop, taking more detailed pictures. The robot field geologist paused on Sol 3055 (August 27, 2012) to take some pictures of her rock abrasion tool (RAT), just a check to re-confirm the state of the instrument's bit for future grinding. "We want to be able to use it and so we're just checking it out," Squyres confirmed. The rover then took an atmospheric argon measurement with her (APXS). That same day down on Earth, the MER team encountered a power outage at Canberra, so we didn’t get a downlink in time,” said Squyres. “Everything looked good, but we didn’t get the images looking off to the west, so we couldn’t really plan anything. The images showed up through the DSN's Madrid station a few hours later, including a Navcam 4x1. "Look at that,” said Squyres, pointing to a richly layered outcrop, appointed with several fins, including one that was fairly prominent as it jutted up from the outcrop. Opportunity paused in late August 2012 to take this self-portrait in shadow and Stuart Atkinson processed it for the MER Update. "It looks like the fins are harder material and the surrounding brighter rocks are softer material, so wind erosion has just left these harder materials standing above the surroundings," Arvidson assessed later, after the SOWG meeting last week. "The fin is probably a tough rock, so it just resists erosion and sticks above the surface. You can imagine wind erosion has been stripping away the rim and that harder tougher rocks would be left as fins. It looks like it’s going to cut you, like it’s really sharp. But these images are a little bit off, because you’re looking at a view from a stereo system," he explained. "Remember when we first landed at Eagle Crater and we saw the rocks on the wall and called it The Great Wall, and then when Opportunity drove up to it, the Great Wall was about the size of our wheels?" Arvidson continued. "It’s kind of a misperception. If you look at these outcrops topographically, they look really high and steep, but you have to have eyes that are much broader and wider apart than our eyes to get an accurate perception. So this fin is actually about 20, 25, 30 centimeters (7.87, 9.84, 11.81 inches) tall." In any case, he added, "We’re drawn to it because it’s so cool looking." Such fins are "very common" on Earth, and prevalent especially in the Southwest, said Arvidson. "If you go to places in the southwest, like Ship Rock Dike Utah, where dikes have been exposed by differential erosion with magma into sedimentary rock, and then erosion has taken away the softer rock, you can see these fins sticking above the surroundings." “There’s a possibility that what we’re going to decide to do is stop, slam on the brakes and drive straight for those outcrops today,” Squyres said before the SOWG meeting on Tuesday August 28th. Opportunity took these images with her stereo panoramic camera (Pancam) in late August of a wild looking outcrop that features fins. Stuart Atkinson processed them individually and then processed them in color and put them together for the panorama at the beginning of this MER Update. The rover is currently checking out the outcrop and in on the hunt for clay minerals, which according to orbital data may be lurking within. During that meeting, JPL's Tim Parker and Arizona State University's Steve Ruff bravely offered up a couple of thoughts about other possibilities for Opportunity – briefly diverting course to inspect another vein or heading further south before stopping to work – but the wild looking ridge with the fin-appointed outcrop was compelling. “We have spectacular layered clay bearing outcrops to our west, and so a reasonable thing at this point would be to take a hard right turn and head directly towards those outcrops," said Squyres. Arvidson concurred. “Remember that after we’re done with whatever we do here, our ultimate goal is to go south, so we will continue south,” said Squyres. “How the clay is actually present is an open question – could be present in outcrops, could be scree and fine-grained debris that has been shed from outcrops and it could be crushed up stuff that we will drive across. We’ll drive to the outcrop and we’ll see what we see. We’ll look at the stuff we drive across. This is a purely exploratory move -- we are about to embark on something totally new and different." Although Ashley Stroupe, one of the rover planners, alerted the team that Opportunity on this particular due west route would have to cross an undefined dip that was obscuring some of the terrain beyond it, and suggested veering to the south just a bit, just in case the dip was danger, Squyres and Arvidson were pretty set on the due west route. "When you look at Hi-RISE images, there’s nothing really scary in this area,” said Squyres. Moreover, the direct west route was taking Opportunity "right into the area where CRISM detected the clay signature,” he pointed out. "I think we're in the sweet spot," added Arvidson, bolstering Squyres' desire to have the rover continue due west. Still, the mutual respect between the MER scientists and engineers is real and the team made a decision to drive a few meters less, just in case. So the plan that was decided on in that SOWG meeting and uplinked to Opportunity commanded her on her Sol 3056 (August 28, 2012) to make that hard right turn and drive almost due west in a direct approach to the fin-bearing outcrop. With that drive, the rover chalked up her 35th kilometer, bringing her odometer to 35,029.36 meters to be exact, or 21.75 miles. For a vehicle “warrantied” for about 1 kilometer (0.62 mile) and 90 days of lifetime, the milestone is beyond remarkable and yet another one for the books. While the fins found in August 2012 on Mars are around an estimated foot high, the Earth has some pretty pronounced fins. 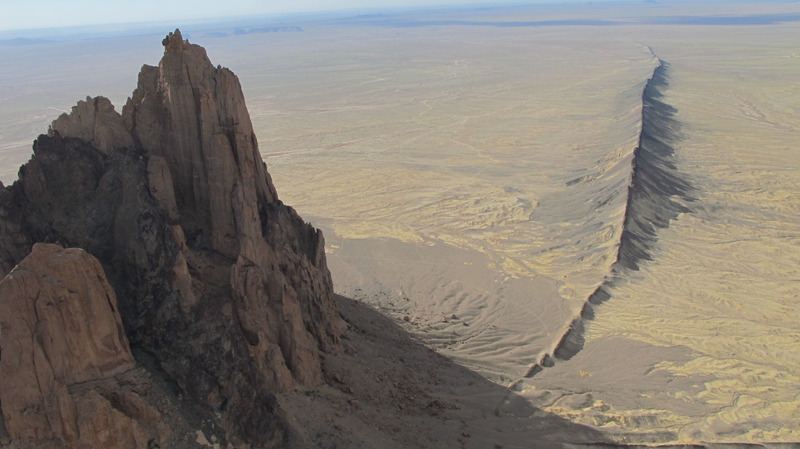 This image which was pulled from Aerial America, a series on the Smithsonian Channel, shows the dikes and fins that formed above them by differential wind erosion at the ancient volcanic area of Ship Rock, located in the Four Corners area of the United States. Opportunity is now within "striking distance" of the 35.89-kilometer record of the Apollo 17 Moonbuggy, noted Nelson. And less than two kilometers past that, this Mars Exploration Rover will become the most extraterrestrially traveled robot, manned or unmanned. “But it won’t be until the rover gets to the end of Cape York and finishes the science here that we’ll start racking up the miles,” said Nelson. “Cape Tribulation is about 2 kilometers away, but Knobby’s Head and Sutherland Point will come first." On that first drive to the west, she drove by a notable vein – “what looks to my eye is one of fattest substantial veins we have seen,” said Squyres – and stopped for some mid-drive Navcam imaging. The objective was to get pictures that were “good enough” to characterize the vein’s width. “If we find out its big enough to fill APXS field of view, we will likely hit that after we are done with the outcrops, if it is big enough," he said. As August turns to September, Opportunity, with a solar array dust factor was 0.684, is producing 568 watt-hours of power and seem raring to keep on going. The Tau has fallen a bit, to a still hazy 0.570. In coming sols, Opportunity will move in on the as yet unnamed outcrop, with another drive planned during the Labor Day weekend. "We’ll probably drive up to the fin and the surrounding softer, brighter rocks and do an IDD campaign on both and continue remote sensing, a lot of 13-filter Pancam data," said Arivdson. "My sense for the campaign is to work our way up hill, because we can see other strata and this is aerially extensive and is probably the source rocks for the clays we’re seeing from orbit," he said. After Opportunity took this image of the finned outcrop, the MER team decided to have the rover make a sharp turn to the west to investigate. 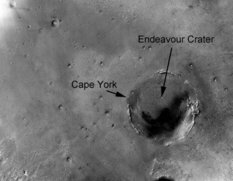 "Typically, what happens is the rim and the ejecta tilt outward from the impact crater, like at Meteor Crater, but now we can drive up section," Arvidson continued. "One can imagine a science campaign in which we start with the fin and surrounding rocks, and then just move up hill where we see a stratigraphic context moving to younger rocks. Or the rocks might be overturned and we’re on the overturn flap of the ejecta and going down section. Either way, it’s a stratigraphic section above a crust that was emplaced as part of the formation of Endeavour Crater . . . so we’re going to be able to put together how this impact actually occurred and how the rocks were emplaced and make some stab at trying to understand what’s emplaced rock that’s just uplifted and what’s actually part of the ejecta and whether it’s right side up or upside down. That’s pretty cool." Any chance the fins would contain clay minerals? 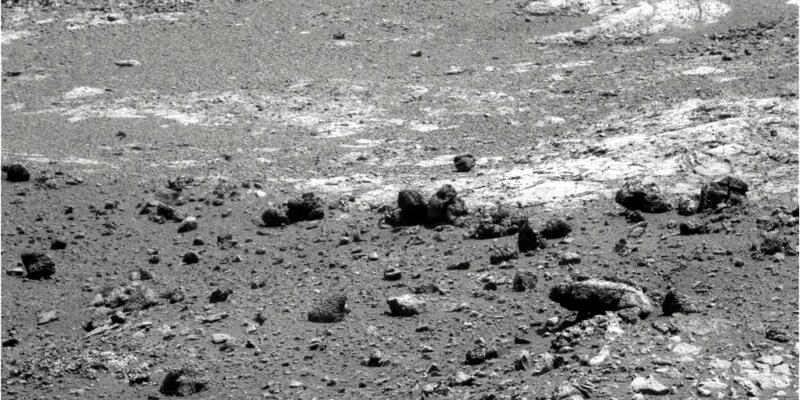 "They’re too small and they look less altered than the bright rocks," said Arvidson, who's been studying Martian geology since Viking in the mid-1970s. "I'm carrying two models for the fin and surrounding rocks," he said. "Is the fin a basaltic breccia, kind of like what was excavated by Odyssey, the crater, and the Tisdale boulder we visited last summer? 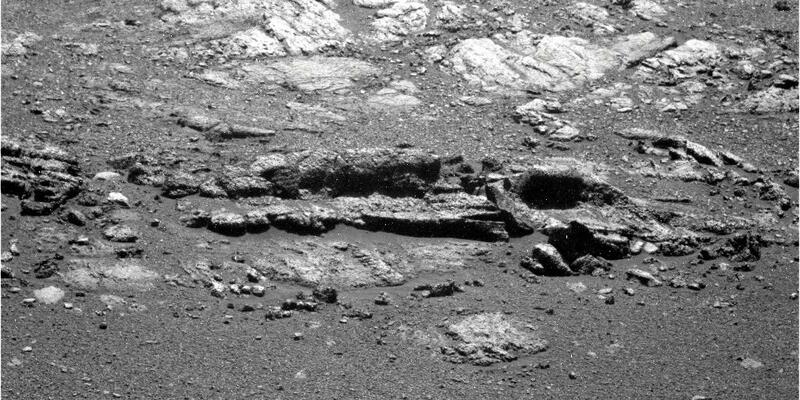 Or are the rocks that Opportunity is currently exploring very old sedimentary rocks that have somehow been preserved on the rim of Endeavour? We should be able to test between these two models with Opportunity over the next several weeks." "We don’t know what we’re going to find, but we’re here and we’ll go up there and see what we see," Squyres summed up. "This is going to be decision making on a daily basis from here on out, because we are moving into unknown terrain, going after an important science problem and we don’t know what we’re going to find, and so we just got to be ready to respond to what we see." As the Sun sets on August 2012, Opportunity is making tracks as the MER mission begins another new adventure, searching for clay minerals and evidence for an environment that once featured a more alkaline water, and a potentially habitable environment for life to emerge. Ground-truthing the presence of the clay minerals, the smectite, won't be a cakewalk for Opportunity. With the mineral detecting miniature thermal emission spectrometer (Mini-TES) and the iron detecting Mössbauer out of commission, "it's getting into incredible detective work, doing the best job we have using Pancam imaging for morphology and color and for spectral properties, and then MI and APXS to get us into the details," said Arvidson. "If we’re lucky, we’ll find rocks that have been chemically altered to the point where they are no longer these pure basalts that we keep seeing, and altered in a way that we can reconstruct what would be consistent with rocks bearing clay minerals. It remains to be seen what we'll find. It’s exploration and discovery." 1. J.J. Wray, et al., "Phyllosilicates and sulfates at Endeavour Crater, Meridiani Planum, Mars," Geophysical Research Letters, Nov. 4, 2009.